With up to 8.1 GB/ Min transferring bandwidth, it meets industrial demand. 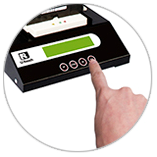 Each SATA interface is independent, and parallel to the controller. Unlike other duplicators or PC, this allows all targets of HDD to duplicate at the same transfer rate up to 8.1 GB/ Min without reduction. Easily Plug in to copy and pull to unload. Increase loading speed with single hand. No more manual plugging and unplugging of connectors and no more fingers injuries. Internal connectors are modular and it is easily replaceable after wearing. Optional bay module for different HDD models available on eSATA, mSATA SSD, VDR, 2.5"STA. Different files system or major OS are supported this includes, Linux, Unix, Windows, Macintosh. Quick Copy, All Partitions and Whole HDD copy. Allows copy whole HDD bit for bit or just a partition, or contents only. At hardware duplication, DATA are taken bit for bits, there is no differentiation on DATA Contents or empty sectors. Its normal function is to clone. Quick Copy Mode identify and compatible with the HDD formats of FAT16/32, NTFS, and Linux(EXT2/EXT3/EXT4). Able to identify them, allow file structure to be read and hence copy only data area without copying complete HDD. Which can greatly reduce total cycle time. For example a 2TB HDD with only 100GB of space used. CT600 can grow with your expansion. Starting with 5 targets single tower, the unit can be chained up to 10 towers. Duplicating simultaneously without reduction in transfer rate to 59 targets in one single cycle. The most secure way to guaranteed data is 100% duplicated is to "bit-for-bit COMPARE" function. CT600 can compare at the same rate as writing, which make it fastest in the industry. Preventing data leaking out is one of the most important concerns in any organisation,. CT600 employees the DoD erase, which Comply with erasing standard of the U.S. Deparment of Defense. This allows any organisation to erase with confident before any HDD is handed out for destruction. The operation info including operating progress, speed, and even the capacity, model name, S/N of HDD are ALL recorded! That means you can look at all the record when you need to track for any issue. It’s so much convenient for trouble shooting, work responsibility clarification, exporting testing report, work management. PC-link is absolutely perfect for MONITORING the work progress during operation. It shows all the information, including writing speed, operation time, percentage of completion, etc. for EVERY PORT, which is a powerful tool for sorting out the lagging writing HDD and keeping the operation in most efficient. All the information you need will be shown on screen of PC. 1. It’s able to monitor duplication status from PC while duplicators are connected to it. both sources HDD and target HDD are recorded. 3. Slow R/W speed HDD detection: lagging HDD can be easily sorted, because user can see the duplication speed of every port by. 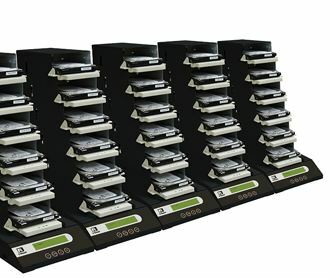 When the duplicator stop executing any function, the machine will automatically cut off the power of each port to protect the HDD from damage during removal from the duplicator. The power of each port will only be supplied when the operation is on. Platform design helps better heat radiation and better operation stability. There are two modes of operation, stand-alone and PC-link operation. User can choose either mode to satisfy different need. 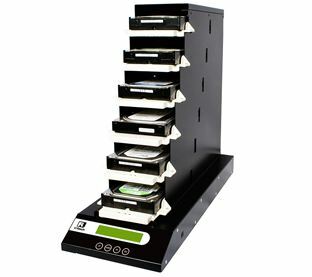 Stand-alone is excellent in simplifying operation and very user-friendly (operating on four buttons of duplicator would complete all the jobs). Very simple and easy to use. It doesn"t require a high level of expertise for operation. Easy to maintain with low cost.